(Scotiabank Field at Nat Bailey Stadium - Vancouver, BC) - In partnership with the Boys and Girls Clubs of South Coast BC, the Vancouver Canadians Baseball Foundation (VCBF) has successfully concluded its first-ever mini league in North America. This first-of-its kind initiative introduced well over 200 local kids in need to the game of baseball over a seven-week period at the historic Scotiabank Field at Nat Bailey Stadium. Based on coach feedback and player results, the mini league didn't just teach kids about the game of baseball but also valuable life skills including self-confidence, teamwork, how to win, how to lose and how to have fun. Randy Castellarin a volunteer coach for the mini-league, agrees wholeheartedly. "These kids are amazing. They're so eager to learn and to be part of the game. Their progress in terms of baseball is incredible, but what's really amazing is their attitude. They've become eager, engaged and confident. I'm really proud of what they have achieved." According to Carolyn Tuckwell, President and CEO of the Boys and Girls Clubs of South Coast BC, the summer mini league has been enthusiastically received by both participants and their parents. "The kids are not only excited to have learned a new skill set but also thrilled to have played baseball at Nat Bailey Stadium, where the professionals play. It has been amazing to watch them develop their physical, social and personal skills over the past seven weeks." Di, an 11-year old playing in the "Coach-Pitch" division says," The coaches made it really fun. They showed me that if I really tried, I could hit a ball, throw and catch. When I first started, I was scared I wasn't good enough to play, but now I know I am." Jeff Mooney, who co-chairs the Foundation with business partner Jake Kerr, is passionate about the power of baseball to inspire local youth. "Most of these kids don't have a lot of opportunities through circumstances beyond their control, but when you give them something they run with it. Sometimes all it takes is one person to show an interest and that makes all the difference. The VCBF is thrilled to be making a real impact with this program and changing the lives of these kids by giving them an opportunity they may not have had otherwise." Though the first season of the VCBF mini league officially came to a close on Friday August 17th, one thing is certain, the kids that participated have learned lessons and made memories that will last a lifetime. The mini league consisted of two divisions: "T-Ball" ages 6-8 and "Coach-Pitch" ages 9-11. The dates of the 2013 mini league will be announced early next year. 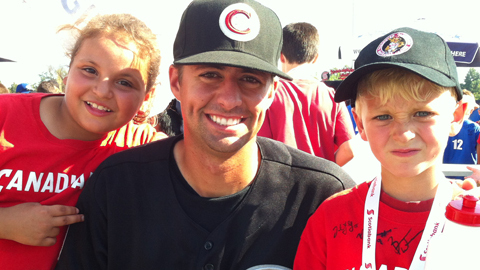 The Vancouver Canadians Baseball Foundation (VCBF) was founded on the vision of helping youth in need find self-confidence, hope, improved health, and a skill set that will help not just on a baseball diamond, but in life. Its programs include; the mini summer league, UBC scholarships, a premiere league event as well as additional events and fundraisers. From helping a young child onto a baseball diamond perhaps for the first time, right through to helping a bright minded student find a way to continue their post-secondary education, the Vancouver Canadians Baseball Foundation is committed to our community and to helping redefine a child's perspective on the game of baseball.